Getting there: From US Highway 281 in northern San Antonio head west on Loop 1604. Take the N.W. Military Highway exit (a.k.a. 1535) and head north for 2 miles. 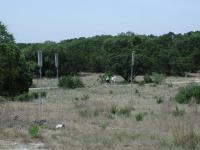 Look for the park entrance on the left just before the entrance to Camp Bullis. There is plenty of parking. Walkers descending down the trail from the Observation Tower. The boxes on poles in the foreground are bat houses. The Hike: Eisenhower Park has a trail system of opposites. 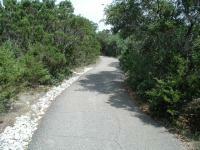 On the one hand there are several paved paths more suited to a family stroll or jogging than hiking. On the other hand, there are numerous natural surface trails that provide a surprising level of difficulty in spots. The sum of it all is that most anyone can find something to like about the park. The easiest trails are those that are paved. These are shown on the topo map in blue, to differentiate them from the more difficult natural surface trails. The most interesting of the three paved trails is the Cedar Flats Trail that cuts through the center of the park, starting at the trailhead on the eastern side of the park and ending up at the western end of the park. Some minor elevation dips turn into a steady climb as the trail nears the western edge. 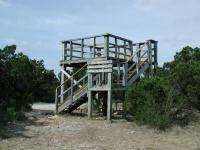 At the end of the trail a loop encircles a wooden viewing platform situated on one of the highest points in the park. There are a couple of good views up here, but there would be even more without the quarry and high tension power lines that lie in the direction of downtown San Antonio. At a highpoint in the park this observation tower provides a way to peek over the trees. More interesting to hikers are the natural surface trails that make up the majority of the park's mileage. The Hillview Trail circumnavigates almost the entire perimeter of the park, oftentimes following the park fence in a straight line. And while the southern boundary is shared with a rock quarry, the dense bushes planted to hide the site of the quarry as much as possible do a pretty good job. 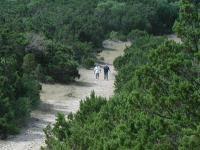 The natural surface trails are a little less crowded and provide more of a hiking experience. The western and northern corners of the park are the roughest and the trail can get quite steep for small segments. 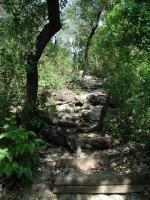 For the most part these steep sections occur on natural rock steps. One can get a good stair master workout without having to worry about sliding on a scree slope. 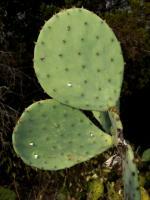 About one third of the Yucca Trail is paved, but the rest features a natural surface. The natural trail starts near the southern boundary of the park and eventually cuts a diagonal line towards the northwest, crossing the Cedar Flats paved trail in the process. 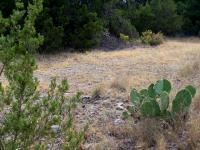 Six campsites are available in the park at the end of the Yucca Trail for those that would like to camp without venturing too far from San Antonio. 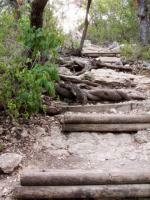 The natural surface trails can provide some physical challenges. Parts are rocky and steep. The biggest surprise on the Sunday morning I visited was a rock concert near the parking lot! I first heard the music while on the trail and I thought it was some inconsiderate visitor playing their stereo loudly, but it became obvious that it was live music. Eventually I determined that it was a Christian rock concert. Apparently there is a pavilion complex near the park entrance. Thankfully, the sound did not carry all the way to the back of the park. Stick to the western and northern ends of the park for the best hiking experience. 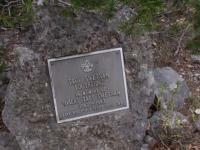 The park boasts a fine trail map that includes a guide to the interpretive markers found along the trail. 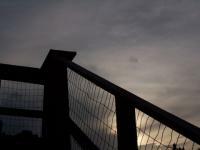 The low wooden posts can be hard spot and I was only able to find about half of those listed. Still, the guide provided an opportunity to brush up on some plant identification. The development of the trail guides was an Eagle Scout project of Matt Badders of Troop 650. Thanks Matt! Eisenhower Park is fairly popular, so don't expect much in the way of solitude. However, the natural trails do attract fewer people and the trails in the northwest corner of the park also seem to get fewer people still. Upon hiking all of the trails and doubling back on some of them I totaled about 7.5 miles and 900 feet of elevation gain. I can see why it's so popular. After hiking Friedrich Wilderness Park in the morning, my friend and I headed over to Eisenhower Park to get some additional mileage in. Like Friedrich, Eisenhower is small, but it has some challenging hills. You can also go up to the top of a wooden observation tower and get a nice overview of the park and surrounding area. Unfortunately, my friend was feeling very well, so we cut it short and didn't hike all of the trails. 2013 was an incredibly ambitious year for me hiking-wise, so it was nice to end the year with this "short but sweet" hike. 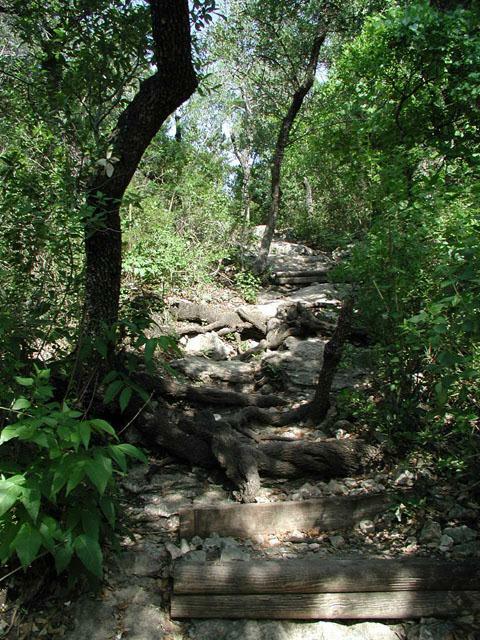 I want to thank Austin Explorer for creating this awesome website for everyone to log their hikes. To the hiking community, hike on! I come here all the time and i love it. Been hiking at Eisenhower since i was 12. Definitely a great way to spend a cool day! Brought my "60 hikes book" but they offer a better map at the trailhead for free. Took the HIllview trail which gets VERY steep along the right/west side of park. Took the Red Oak which I didn't enjoy as much but Hillview was great. Tower offered a nice view. Came back on Yucca to the east til it hit Hillview. Lots of people for a Wednesday morning and at least a dozen large planes flew over. VERY well marked at every intersection so don't worry about getting lost. I'd love to hike this more if I didn't live in Austin. I love this place! It is close to my house and I like how they pack so many different types of trails in such a small area. I tend to avoid the paved trail though, which also is the most heavily used. Good place to go for beginner hikers and vets alike. Well kept trails, excellent markers. We visited this park on New Year's Day and were surprised how many people had the same idea as us. We set off on the un-paved Yucca Trail and found some challenging portions but they ended far too quickly. 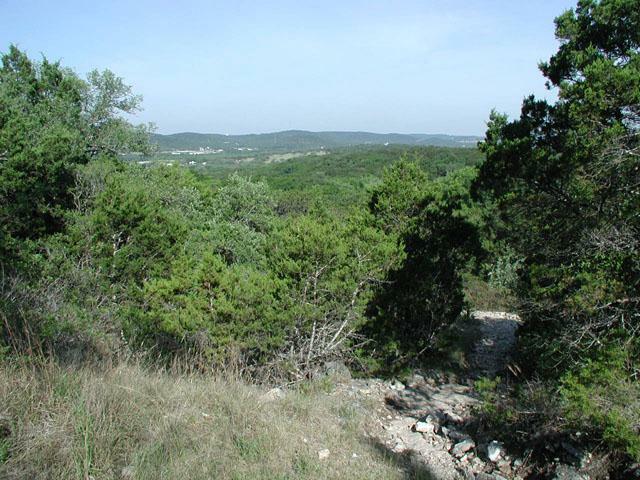 When we intersected Hill-view Trail we made our way to the observation tower for a bit of irony, there we were looking to get away and all you can see is San Antonio. Our party enjoyed the mix of challenging sections and the well groomed trails with clearly marked trail markers. 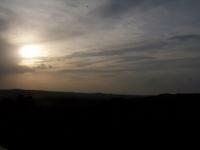 The tower offered a nice view and was worth the trek up and "summiting". All in all we enjoyed our three hours at the park and will not hesitate to visit again. 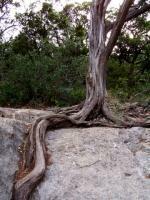 There are many trail types available - from naturally rugged to paved with frequent sitting areas. Admittedly you can hear traffic at times and do run into others, but neither has been enough of a problem for me to stop coming. I enjoy the well maintained trails and the view from the tower. For those with kids, the rock climbing playground area to the right of the trailhead is frequnently empty for an added adventure. Maps are available at the trailhead to help to set your route. On this day, I took Hillview (natural, rugged) to Red Oaks (natural with a wooden bridge) to the paved path to and from the look-out tower. The hike took a while, as I frequntly stopped for photos. Hiked the trial for the first time today with my brother. 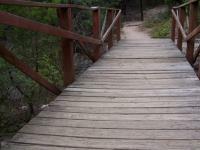 We stayed on the natural Hillview Trial and merged with the Red Oak trail ( nice bridge). If you find yourself out there take the time to see the Observation Deck (nice views). Not recomended for small dogs. Very nice and maintained Park. This park is close to our house and we try to walk it with our black lab Harley.